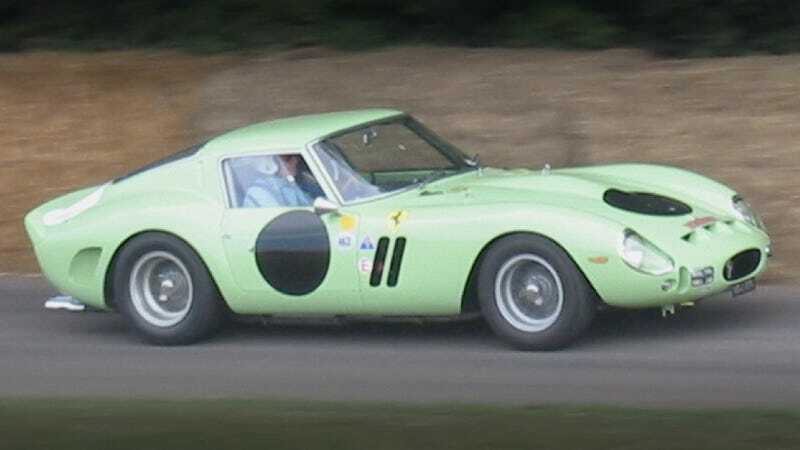 This apple-green 1962 Ferrari 250 GTO is now the most expensive car in the world. The 250 GTO is revered by Ferrari collectors as the bees knees, and a private sale last month broke all previous price records, proving how much people are willing to slobber over a piece of artistically crafted machinery. Only 39 250 GTO's were produced, so the aging cars' prices were bound to skyrocket. But when this one last changed hands ten years ago, it fetched a measly $8.5 million. But Seattle based collector Craig McCaw saw fit to fork over four times that much to get his hands on the car that was built by Ferrari for U.K. driver Sir Stirling Moss. Moss never even got a chance to race it. A horrible crash at the Goodwood Circuit in Sussex in April 1962 put an end to his career. Innes Ireland, his teammate, raced the car at the 1962 LeMans. It never raced again, but instead entered the shadowy world of private car collectors, where it racked up few miles, but a lot of value. Hence today's alarming, but not surprising figure. Bloomberg reported that eight collectible Ferraris have sold over the past couple of months, racking up a total of $135 million for the sellers.